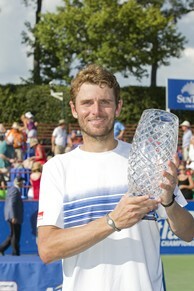 Mardy Fish won his fifth career ATP World Tour title at the Atlanta Tennis Championships this afternoon. Fish overcame a one-set deficit (the only set he lost in the tournament) to defeat the hometown Georgia Bulldog, John Isner, 4-6, 6-4, 7-6(4). The win marked Fish's tenth consecutive match victory on the ATP World Tour. Fish has now won back-to-back ATP World Tour titles after winning in Newport two weeks ago. For the first time in his career Fish has won two ATP World Tour tournaments in the same year and he will take his game to Los Angeles next, where he will be aiming to win his third title in a row. "This is as top as I’ve ever been," said Fish. "I’ve never won two tournaments in one year, I’ve never won two tournaments in a row, and on the ATP [World] Tour, I’ve never won 10 matches in a row. It’s probably as good as it’s been. " Top prize money for Fish $95,845. He also won 250 South African Airways 2010 ATP Ranking points as the winner of the ATP World Tour 250 hard-court tournament. Isner earned $50,500 and 150 South African Airways 2010 ATP Ranking points. Fish also took the lead in the Olympus US OpenSeries standings following the first tournament of the North American hard-court season. On Sunday, after Isner claimed the only service break of the opening set, Fish stepped up his play. With Isner setto close out a straight-set victory, Fish stepped up to break his opponent twice in three games – allowing him to level the match at a set apiece and go up 3-1 in the decisive set. However, as Isner immediately broke back, he forced Fish to fight off another break point chance in the ninth game. Fish won the first four points of the tiebreak. Though Isner countered by winning the next three, the No. 6 seed held on to clinch the two-hour, 45-minute win on his second match point. "It was a little lucky to pull through," said Fish. "Today was an extremely physical match just with the heat. He’s no fun to play, that’s for sure. He gives a lot of people a lot of trouble."